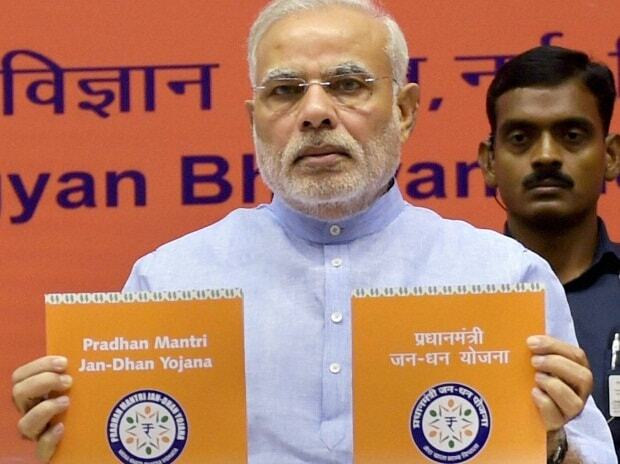 Prime Minister Narendra Modi today formally launched the government's financial inclusion programme - the Pradhan Mantri Jan Dhan Yojana. The project. which will help provide a bank account for every Indian household is widely seen as the first comprehensive financial inclusion scheme in the country. Speaking at the ceremony, Finance Minister Arun Jaitley said 1.5 crore accounts will be opened on first day of the scheme. He said the scheme will be carried out on a "mission mode". He said the scheme hopes to rope in 7.5 crore accounts by Jan 26th, 2015. Speaking at the event, Prime Minister Narendra Modi said more than 1.5 crore people getting insured in one day is a big record in the banking history and that the scheme will provide confidence to people. He said the scheme's objective was to eradicate poverty and eliminiate the "financial untouchability" that exists in the country. Modi said the scheme is a big step towards women empowerment as they "can now save their money in a safe place". With a bank account, every household will gain access to banking and credit facilities. In the first phase, every account holder will get a RuPay debit card with a Rs 1,00,000 accident cover. Additionally, those who open accounts by Jan 26, will be entitled to an additional life insurance of Rs 30,000. It will also give customers an overdraft facility of up to Rs 5,000 to Aadhaar-enabled accounts after satisfactory operation in the account for six months. Ahead of the launch, RBI also relaxed some KYC norms. Trying to ease the process for migrant workers, RBI has allowed users to submit just one address (either current or permament) as proof. For people, who don't have valid documents, RBI has allowed opening of 'small accounts' through self-attestation. The small accounts, which will be valid for a year but can be extended for another year, have limitations on credits, withdrawals and balance.